I made a mobile. It is not g33ky. I considered making a mobile that re-enacted the destruction of the Death Star, with a big sphere in the middle and little TIE Fighters and X Wings spinning around it... but my husband said, and I quote, "Let's give the kid a chance." 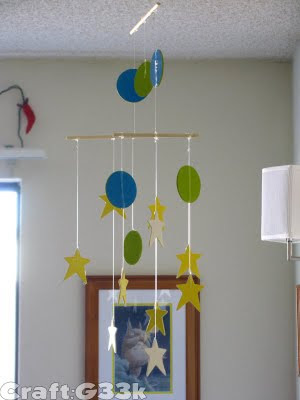 So I made a simple mobile with stars. Which are spacey but not too much. It's made out of wooden dowels, wooden craft shapes, monofilament, hot glue, and acrylic paint. And that's a Totoro print in the background, because Totoro never hurt anybody. LOL! Best quote EVER! But, I would think that the best party about having a kid would be dressing him/her up in a lil Trek costume. =) Love your mobile!